One of the issues that brick and block masonry contractors continually have to deal with is the continuous need to re-temper mortar that has dried up. Low mortar pans are a great deal longer and wider than they are deep, and evaporation happens quite quickly because of the large surface area combined with a lack of depth. Avnix mortar tubs save brick masons a large amount of time and money by letting mortar last longer and time lost in re-tempering. A mortar tub is a deep mortar tub that is Intended to be used with a forklift. Since it is a deep box as apposed to a shallow pan, there is not as much of surface area at the top. With a less amount of surface area, you have less evaporation. Mortar stays fluid longer and does not dry out as it does in a pan. This results in a great cost saver for construction businesses working in states like Texas and other hot regions of the country. Workers are more efficient, and projects are consequently completed quickly and on time. Mortar tubs are also much safer to use than pans when working in lofty places. Numerous mortar pans can add up fast and use more room on the scaffold than is handy or safe. Since they are so shallow, they are a great deal easier to both trip over and accidentally knock off the scaffold. Numerous safety hazards can be avoided by using a deeper, more compact tub that takes up a reduced amount of room on the scaffold, holds more mortar, and as a result has a more secure center of gravity that will hold the mortar tub in place on the scaffold. Brick masons as a result have more freedom of movement when they use this kind of mortar tub, and workers have more room on the scaffold to organize their tools. A further advantage a mortar tub offers is forklift placement. This helps employee’s to steer clear of the back injuries and fall hazards that regularly result from somebody transporting too many tools, or from losing their balance as they try to place a pan by hand. Letting the forklift operator place a a good deal more stable mortar tub in an easy to get to spot makes it much easier for brick masons to focus on their jobs rather than having to worry about tools and materials throughout the day. Mortar tubs are made from tough 10 gauge steel that can endure the often restricted and difficult environments of scaffold work. Each mortar tub is also built with durable corners that cushion the structure against unintentional collision. One end of the tub is sloped to allow the mason to scoop out the mortar and put it on mortar boards. The brick mason can then take the mortar from the boards as required with no excess waste or spillage, and with the rest of the supply still insulated within the tub. Forklift mortar tubs are available in two standard sizes. 1. 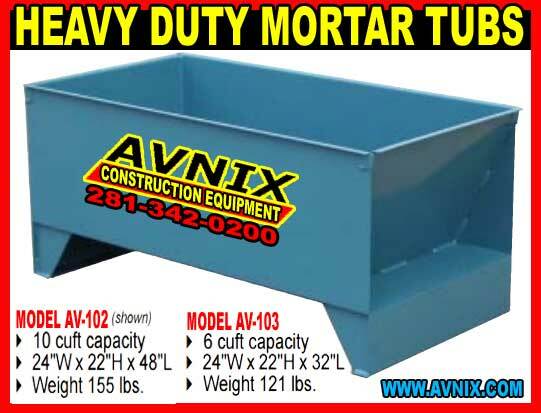 The smaller mortar tub Model AV-102 measures 24″W x 22″H x 32″L and weights only 121 lbs. 2. The larger tub Model AV-103 measures 24″W x 22″H x 48″L and weights 155 lbs. Both offer brick masons a more consolidated and efficient form of mortar transport, storage, and retrieval.